After you say "I do," it's time to listen to someone else's words. Here, a guide to toasting -- when to speak, how to keep it short and sweet, and what to drink. The time for your sorority sisters to do a group song and dance is at the rehearsal dinner -- that's your open-mic night. At the reception, only the VIPs should stand up. The party is larger and the company more diverse, so keep the longer, more personal speeches to the evening before. The host (usually the bride's father or parents) is first up. "The point of this particular address is to welcome the groom's family into theirs, thoughtfully acknowledge any guests who had to travel, and say a few touching words about the newlyweds," says Claudia Hanlin, a Martha Stewart Weddings contributing editor and co-owner of the Wedding Library in New York City. Next, the best man and the maid of honor speak, in that order. "Their words can be more nostalgic, humorous, and lighthearted," she says. After that, one or two other people can approach the microphone. If you have siblings or nonhosting stepparents who'd like to say something, this is the time. Finally, it's the closer's turn. This can be the groom, if he wants to wrap things up with a few sentimental words about his new wife, or the host can come back for a final thank-you (and a "Now, let's dance!"). But What About the Bride? Traditionally, she's radio silent on the big day. "The bride is the guest of honor," says Calder Clark, owner of Calder Clark Designs in Charleston, South Carolina. "At a corporate event, guests of honor don't have to speak unless they're winning an award, and weddings follow the same etiquette." Of course, you may be so overwhelmed with gratitude and joy that not standing up with your new husband to express it feels rude. In the end, it's up to you. There are limited opportunities to get guests' attention without interrupting the fun. And although you may be drinking Champagne at the start of the cocktail hour, that's not the time to make toasts. Says Clark, "It's hard to ask people to hush when they've just come out of a quiet ceremony. They want to catch up with friends, and you want to get the energy going." Match your timing to the style of your meal. The father of the bride should welcome everyone and give a brief toast (emphasis on brief, since the food is waiting in the wings) as guests sit down to dinner. The rest of the speeches can come at the tail end of the main course, when everyone is almost finished eating. The groom and/or bride should step up after the cake cutting. The transition between cocktail hour and dinner is the ideal window for the host's welcome. He or she can end with some direction: "Everyone enjoy -- and I'd hit the mashed-potatoes bar first." Have others speak after the first dance, and save the bride and groom for dessert time. There are no rules, so to speak, at this setup. A good strategy? Ask the host to say a few words at the very beginning, have the rest of the toasts follow his lead, and then get the party started. Whether you decide to talk or not, use -- or pass along -- these helpful hints from planners and public speaking experts. "It's important to map out exactly what you're going to say -- the beginning, middle, and end. If you have a plan, you won't ramble, which will make you feel more confident," says Hattie Bollerman, a vice president at Speakeasy, a communication development company in New York City. "We tell people to aim for three to five minutes, tops," says event planner Maria Cooke of Ritzy Bee Events in Washington, D.C. Any longer, guests get antsy. Remember: Most of the room didn't go to high school with you or the groom. "Only tell stories that will resonate with everyone," says Hanlin. To turn people's attention from their meal to your words, "remember to make eye contact and say things like, 'Am I right?' and 'You all know what I'm talking about,'"says Clark. For other speakers, it's fine to start with "I've known Molly since third grade," but make sure you weave in the groom, too. The day is about both of them. ... a tipsy toaster is on the verge of sharing too much. First, encourage your speakers not to hit the bar until after their moment in the spotlight is over, says Hanlin. If it's too late for that, have your planner or the next toaster on the agenda inch closer to the speaker and reach for the mic. It's not seamless, but it works. Worst-case scenario? "Cue the music," Hanlin says. ... your maid of honor is absolutely terrified to talk. "See if she'd feel more comfortable reading a prewritten poem," says Hanlin. Or, if the stage fright is too much for her to bear, give her an out. She's your friend, after all, and when it comes right down to it, no one will know the difference. If sentiment is what you're hoping for, you can always ask her to write you a letter. ... there's a long, awkward, never-ending silence. Again, rely on the host to take the microphone, quickly pick up the slack (just make sure he doesn't say, "Anyone? Bueller? "), and wind things down. This is more likely to happen at a rehearsal dinner, where you open up the floor to speakers. In that situation, it's also fine for the bride or groom to grab the mic and close with "Let's eat!" Champagne is the traditional choice. The crisp drink, whose name refers only to the varietal made in the Champagne region of France, was first produced in the 17th century with the same in-bottle fermentation process that's used today. And because supply is so limited, it's costly. "It's a case of high demand and small production," explains Moez Ben Achour, sommelier at Marcel's restaurant in Washington, D.C. To score wholesale prices, buy in bulk (try wine.com, which frequently offers one-cent shipping). Each of these bottles is perfect for popping. The classic bubbly may be a celebratory staple, but it's not your only option. 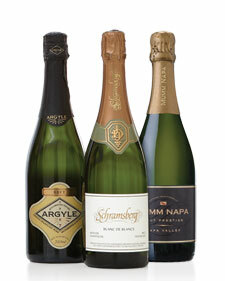 Prosecco, cava, and American sparkling wine are every bit as festive and often less pricey. Raise your glass with these expert picks. 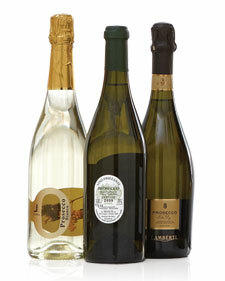 Unlike Champagne, this Italian fizz, which hails from the country's Veneto region, is fermented in large metal tanks. 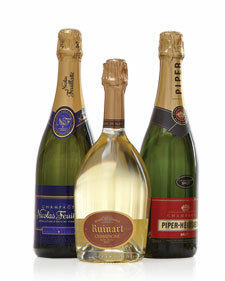 There are two varieties: spumante, whose name means "very bubbly," and frizzante, or "lightly effervescent." Prosecco is drier than most Champagnes and doesn't improve with age. So drink up -- it's best for just one to two years after purchase. Ranging from sweet to very dry, this Spanish wine is crafted in the same manner as Champagne. 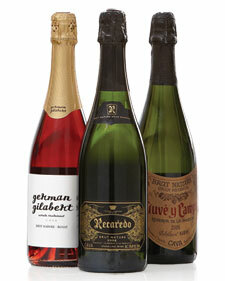 In fact, the word cava translates to "cellar," where the bottles are stored during the fermentation process. It's created in the Catalonia region of Spain and is distinguished by its unique cork, which almost always bears a four-pointed star. Some of these varietals are fermented in tanks, while others are made with the same method as Champagne and cava. They typically come from vineyards in California, where the climate is conducive to year-round production, but you can also find sparkling wine in Oregon and even on the East Coast (try Sparkling Pointe Vineyards, from Long Island).